Marriage proposals, like nostalgia, aren’t what they used to be. Gone are the days when a man’s position was enough to secure a maiden’s hand in marriage. 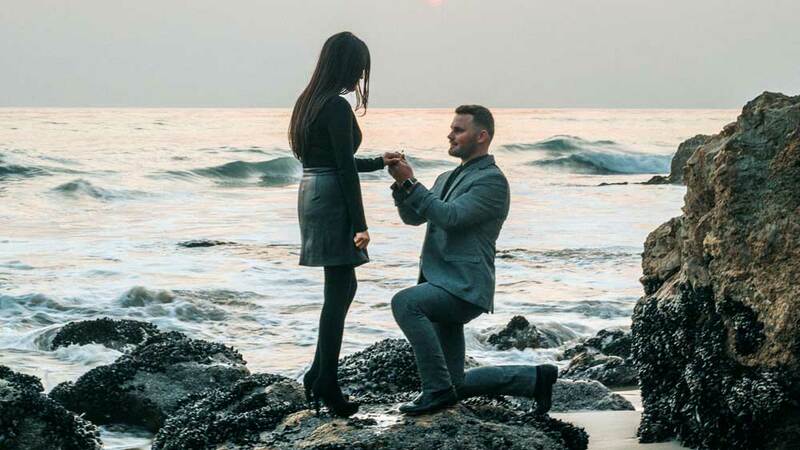 Today, proposals can consist of anything from a simple question in a private setting, to a full-on, no holds barred flash mob in the middle of a busy street. Here is our guide on how to propose! But there are still a loose set of basic rules which you should consider before proposing. Or, if not rules exactly, then at least some questions you should ask yourself before going ahead. In this guide, we address those questions and hope to shed some light on the art of proposing marriage. It’s not intended to help you to plan the proposal in detail, because that’s a decision for you to take based on your relationship, but more a guide on the things you need to consider. The big picture of proposing, if you like. What Do You Need to Propose? Techniquely, you don’t need anything if you want to propose. Just you and her. 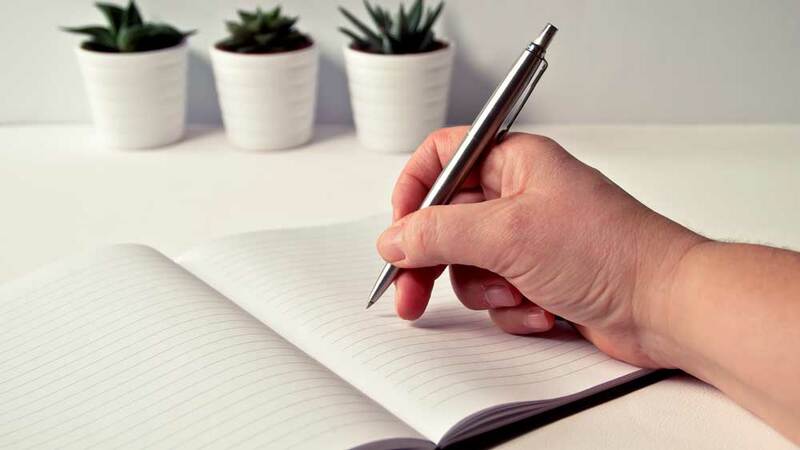 This list mentions the things that you should think of bringing to your proposal. You may take a look at the list and then decide that you don’t need any of them. That’s fine. The main thing is that you are both there. Here is the list of the things that we recommend taking care of before the proposal begins. There’s an old adage which still applies today. No speech can be too short. You don’t need to spend hours crafting the perfect sermon about you, her, your future or anything else. Just a short summary of what she means to you, how she’s improved your life, and how you want to spend the rest of it with her. Finish it off with the question itself, and that’s all you need. Any more, and it could all get a little anticlimactic. She’ll see what’s coming from early on and will be just dying to answer. It will be much easier for both of you if you let her do that. The point is not to be glib and self-dismissive, just keep your proposal compact enough to get to the point before it gets lost in the content. Typically, the speech isn’t read from a paper but comes from the heart. That doesn’t mean that you can’t organize your thoughts in your mind in advance. In fact, it’s probably a good idea. Society has changed in the last 30 years. It is far more common for couples to live together before getting married nowadays than in times past. This makes shopping for an engagement ring a much more varied process. In some ways, it’s also easier, even if you want it to be a surprise. There are caveats to choosing an engagement ring without your partner’s involvement, it should be said. Men aren’t always great at paying attention, and women don’t always trust them with big decisions. An engagement ring is, by both definition and financial commitment, a big deal. If you do want to go it alone and make the entire proposal a surprise, then you need to do some work on what type of ring will be suitable. Jewelry is a very personal choice and almost an extension of the personality of the wearer. To make the right choice, you need to carefully look at what your partner’s current jewelry design choices are. For example, does she like small, delicate jewelry, or is she big on the bling end of things? Platinum/white gold, or yellow gold? Solitaire settings or settings with lots of stones? Vintage or Modern? All this information is important if you are to make the right decision when choosing the ring. Of course, that’s not to say that she will first turn her nose up, and then turn you down, if your choice is slightly off. But why not try to get it right? 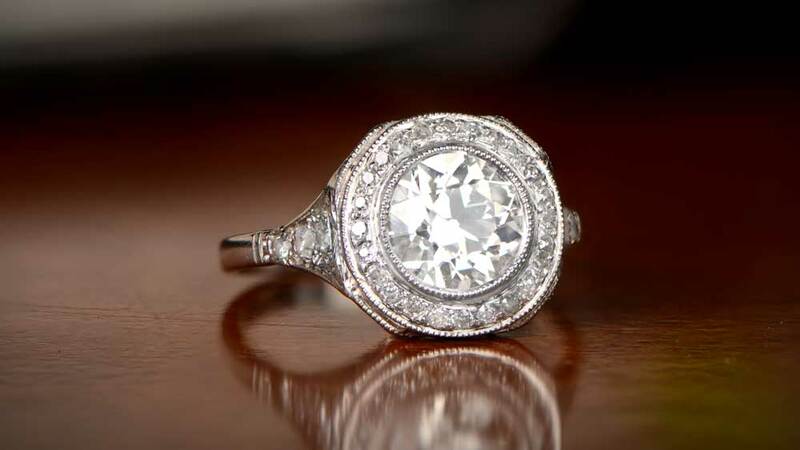 Speak to a jeweler who knows about engagement rings, and who can advise you on your choice. They will have forgotten more than you could hope to know, so don’t be afraid to have a discussion with them. 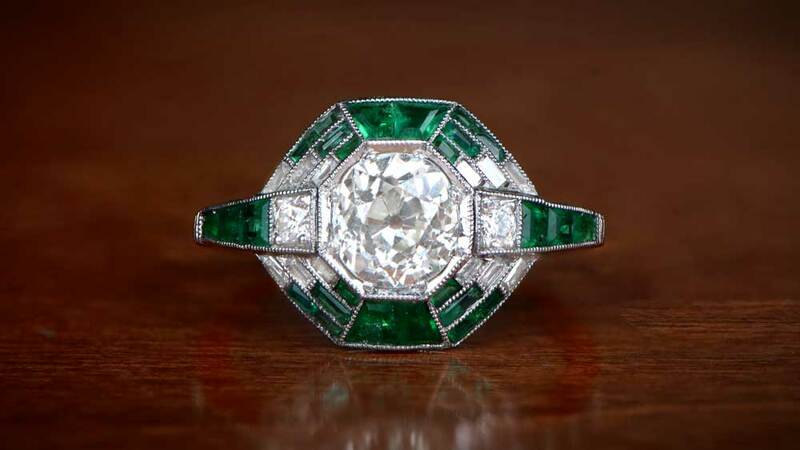 Click here to view our collection of vintage engagement rings. Is It Still Okay To Go Down on One Knee? It’s absolutely okay to go down on one knee if that’s how you want to propose. It’s also perfectly okay to stand, sit, or use whatever position you’re in at the time. Although tradition and convention are great, we do live in a much more relaxed time. The rules of any of life’s traditions are far more mellow than they used to be. 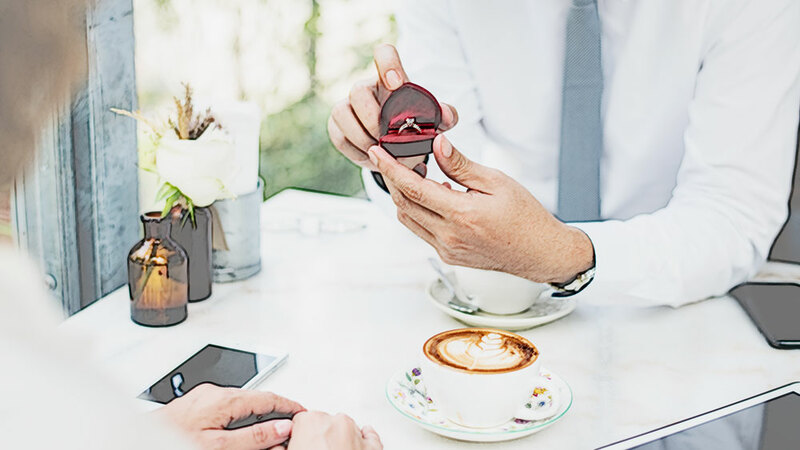 Going down on one knee is still a very dramatic and romantic gesture, but that doesn’t mean it will always be appropriate for your situation. If you’re at home, it’s probably going to be okay. If you’re on a Ferris Wheel, probably not so much. The point is that you don’t necessarily need to organize your actual proposal around it. The issue, if there actually is any problem, with going down on one knee is that it transmits your proposal before you’ve got a word out. That’s okay, of course, but there’s something special about actually asking someone to marry you, rather than doing it via the medium of mime. Please note that many women may expect the proposal to be on one knee. A casual proposal may come across as unromantic. Like many elements of the proposal, it will be critical to cater to the needs of the person you want to marry instead of following conventional wisdom! This is increasingly the biggest question in any proposal. It is often also one of the trickiest to answer with any certainty. 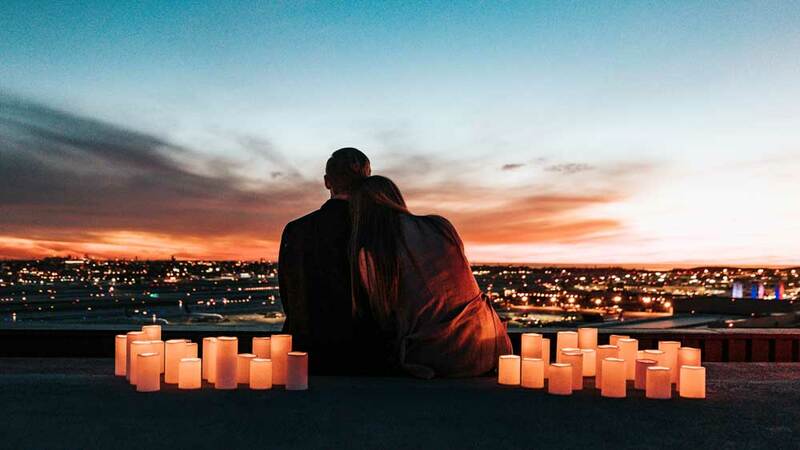 With the internet at your fingertips, organizing a big, dramatic proposal is now very easy. Whether it’s a flash mob, a scripted performance or just with the help of family and friends, nothing is off limits. If your fiancée-to-be isn’t the type for big emotional displays, though, then you would be better advised to play it cool. Being proposed to in front of a group of people may sound romantic, but it can also be embarrassing for the recipient. Click here to read our list of over 40 creative proposal ideas. We also have an article on advice for proposing at home. Again, that’s not to say don’t organize a big event, just make sure it will be appreciated. Otherwise, think private and low key. At home, in a restaurant, it doesn’t really matter. The priority, as with most of the elements of any proposal, is appropriateness. All proposals are, by definition, romantic. That’s the whole point. But one person’s idea of romance may be different from another. If your idea is different from your partner’s, then her way wins, simple as that. For the actual location, lots of that depends on the manner of the proposal. But, assuming you’re not engaging the help of a theater group or a 40 piece orchestra, it may be that you have a special place that you both love. You maybe had a weekend trip or a favorite walk. Anything that is personal, and which is reasonably private is just perfect. There are several dates in a calendar which automatically lend themselves to being good dates on which to propose. Birthdays, Valentine’s, the day you met, your first real date, anything that is significant. December and New Year are perhaps not quite so ideal as they sound, though, There’s already tons of stuff going on during the December Season, and planning a proposal won’t be easy. These are often times when creating a little space, without a packed schedule to worry about, can make a huge difference. Of the 4 seasons in the year, spring and fall are both very popular proposal times. In spring, flowers are starting to bloom, leaves are returning to the trees, and the whole idea of new beginnings is everywhere. In fall, the leaves on the trees are a stunning color, the weather is often perfect, and even chilly days can mean a wonderful walk, wrapped up against the cold. All perfect proposal times. But when it’s snowing, a roaring fire is the perfect accompaniment to the question, so what do you do? You choose what works for you. One thing which should be said is that you can – and should – cancel your planned proposal if something isn’t right. If something has happened, or if things just don’t feel perfect, don’t be afraid to postpone it. Proposing marriage isn’t any kind of dress rehearsal where you get another try if it doesn’t go well the first time. If that means waiting, then so be it. How Long After Dating should you Propose? Of all the questions here, this is the one which is most difficult to answer. There have been proposals made after a few days or a few weeks which have led to marriages which have lasted a lifetime. There have also been proposals several years into a relationship which has seen the marriage itself last just months. If you have reached the point where you know you want to marry someone, it can be difficult to not rush into things. If the relationship is fairly new, say less than a year old, it is more difficult to know if your partner feels the same way. At the end of the day, though, only you can know if the time is right. As well as thinking “Will she say yes?”, ask yourself “What are the reasons why she might say no?”. Hopefully, the answer to the second question will be “There aren’t any”, but ask yourself that question anyway and be truthful about the answers. Marriage is something which, when we start the journey, we hope and intend for it to last forever. The way for that to happen is with the most solid foundation possible. Have that, and the rest is much easier than it will otherwise be. What Is The Right Age For Proposing? This is another tricky question to answer. Life has a habit of only teaching us the things we need to know, about 10 seconds after we realize we don’t know something. Naturally, with years, comes experience. Like knowing if the time is right, only you know if you are old enough. The most important thing to make sure of, however, will be compatibility. If you are 40 and aren’t sure that you want the same things out of your marriage then you aren’t ready to take the plunge. If you are only 25 but already know who you are and what you want, you may be ready to get married. Although the tradition of asking your partner’s father for her hand in marriage has waned in recent times, it’s still a very nice thing to do. The appreciation will be considerable and can help cement a good relationship with your in-laws. In person is always best, even if it means making a trip to do so. Fathers are still protective of their little girls, and a little consideration will go a long way. Here’s some advice on how to ask her father. If she has friends or family with whom you have a good relationship, sound them out first. They will know what answer you’re likely to get and can even help with how and where you actually propose. Don’t try and push a proposal onto your partner if you are unsure about the method and timing. It’s not something you can just have another go tomorrow. Choose your moment carefully. Before proposing, think about what happens next. If you decide to wait to buy the ring until after you have proposed, have an appointment lined up with a jeweler. Have a table booked for a nice restaurant where the two of you can celebrate together. Simple things like this will show that you have thought about what you’re doing. Being in a position where you can make a marriage proposal to someone is the most wonderful thing, it truly is. Nerves will be present, however, cool you think you might be. Those nerves are a good thing, as it means your excitement will match hers when you pop the question. If all the pieces are in place, you will remember the moment for as long as you live. As you are actually proposing, give her a second for the dots to join fully. Our brains work much better with context than with none. There is no context for a marriage proposal. For most of us, it’s a once in a lifetime thing, so it is unlikely she’s expecting it at that exact moment. And when she says yes, be ready for anything!